The manner in which the press acts and Congress, shows they are colluding to the point that they are desperately trying to get rid of Trump at all costs. However, what they are doing in the process is completing the forecast made by our model that this is the collapse in the confidence of government. 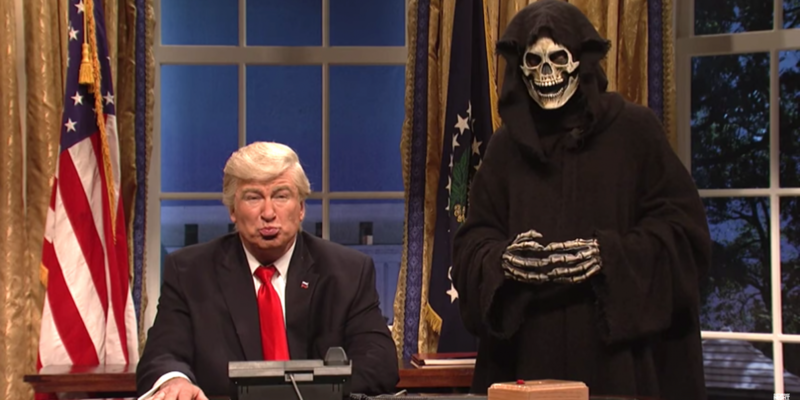 This desperate act to prevent any reform is dangerously taking the domestic political situation in the United States and attributing everything to Russian influence. What they are actually doing is harming the image of the United States globally. Their actions reveal that they are either just stupid or they are really sinister, dangerous, and highly dishonest people seeking to establish their own personal agenda regardless what the people vote for or what is best for the nation. There are many politicians who are against democracy for this is exactly what is going on. We are witnessing an unprofessional and detrimental agenda to the entire business of managing any state. Of course there will be those who instantly say I am referring to Putin. No – this anti-democratic movement applies directly to those in Washington DC as well as Brussels. The very structure of the EU was a deliberate denial of any messy democratic process. The Commission never stands for election. The people can only vote for those in Parliament which has no real vote to do anything but put of a show. 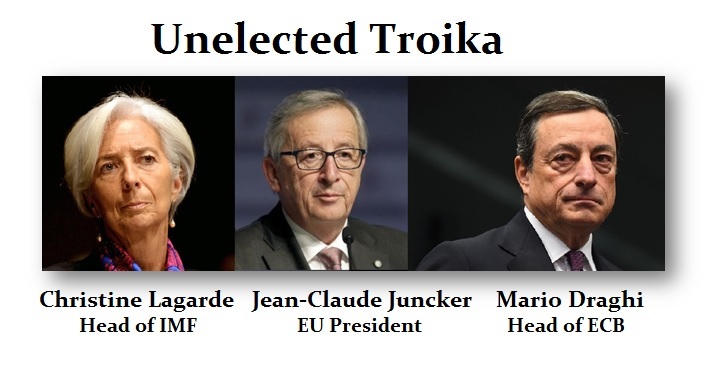 The Troika is composed of the head of the ECB, head of the IMF and head of the EU. None of these people are elected. What is taking place in the United States at this moment indeed exposes the fallacy of democracy. The move to overthrow Trump is the belief that democracy is not fair when one side loses. They refuse to accept anything that Trump promised, and we have women being removed from airplanes for beating up a fellow passenger because he voted for Trump. They really expect that removing Trump will not further divide the country and send it into serious civil unrest. We are witnessing the end of any pretended democratic process. So why is the press and the Democrats fighting so hard no less the pretend Republicans like John McCain and Lindsey Graham? McCain and Graham are simply against reforming a perfectly good corrupt system where they get all the perks. The Democrats and the Press are in crash mode. They are fighting against extinction. The confidence in the mainstream media is at historic lows. You would think they should look at what they are doing and reflect upon reform. No, they simply go all the way with their bias. 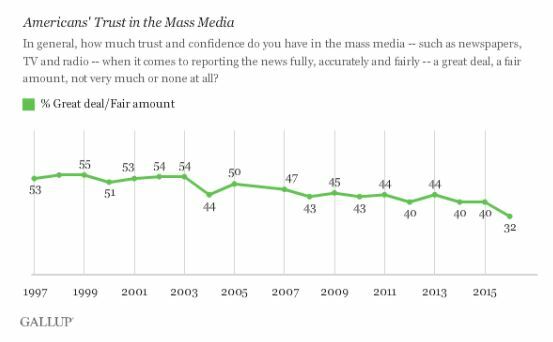 The Gallup Poll is now at 32% of the people trust the media. 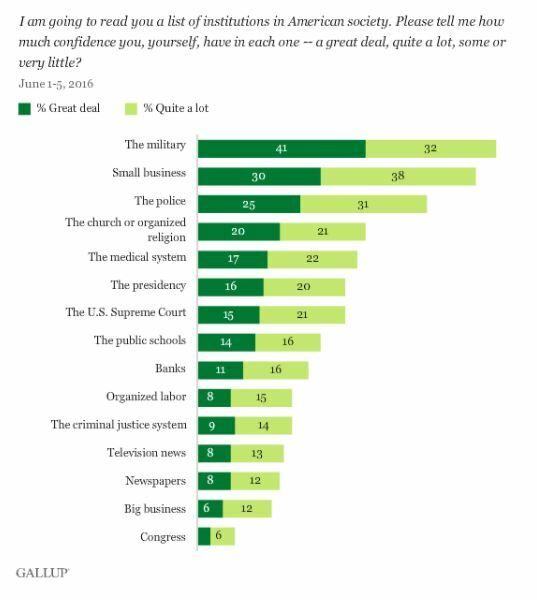 When we look at the Gallup Poll in the degree of trust people have in Congress, we see an astonishing 6% number. As the confidence in government and the press collapses, this is what is undermining the future. 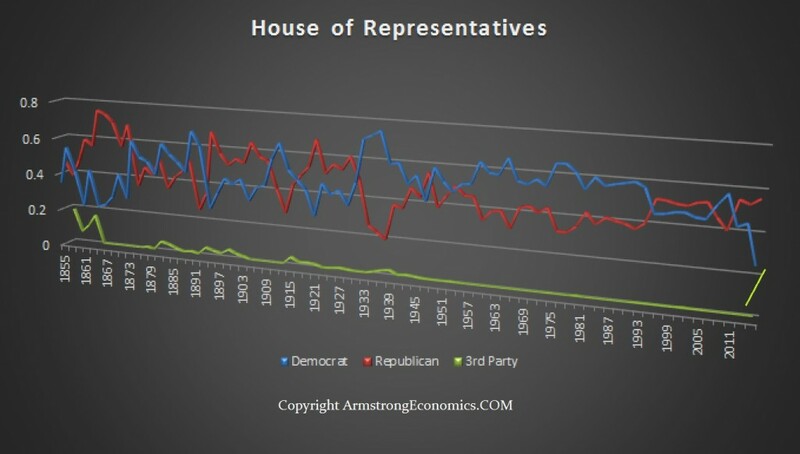 They are not merely destroying the image of the country while making themselves look like buffoons, they are setting this all up for a collapse in the bond markets and a shift to private assets as we conclude this economic business cycle wave. Confidence in Congress and the Press are collapsing.